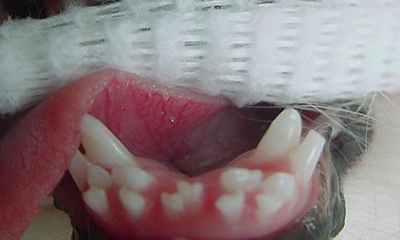 Similar to baby teeth in humans, these are teeth that will fall off after maturity but persistent ones will negatively impact your pet’s bite and comfort. Persistent tooth/teeth will commonly direct an erupting permanent tooth/teeth into an abnormal position. Untreated persistent teeth are prone to tartar accumulation and gum inflammation. Common in toy breeds like Yorkshire Terrier, Maltese, Toy Poodle, and Chihuahuas. 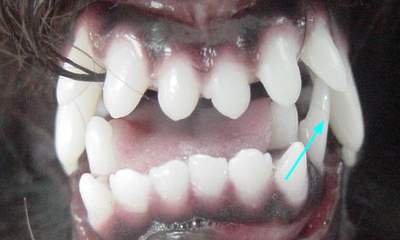 Persistent canine tooth causing the adult tooth into a painful location. Persistent incisor & canine teeth. 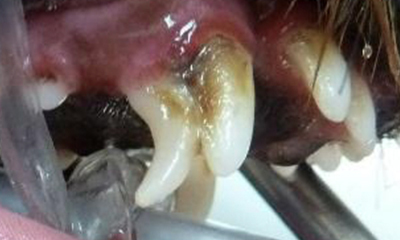 Tartar accumulation and gingivitis due to the retained tooth. Extraction therapy is performed in a manner designed to prevent root fracture or damage to the immature/erupting permanent tooth. 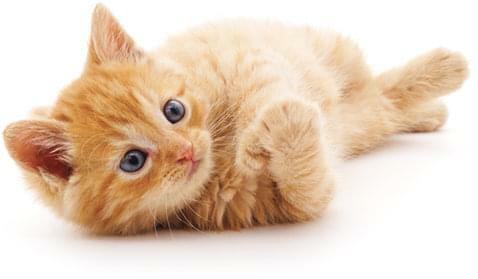 Schedule an appointment today to have your pet evaluated for any persistent deciduous teeth.